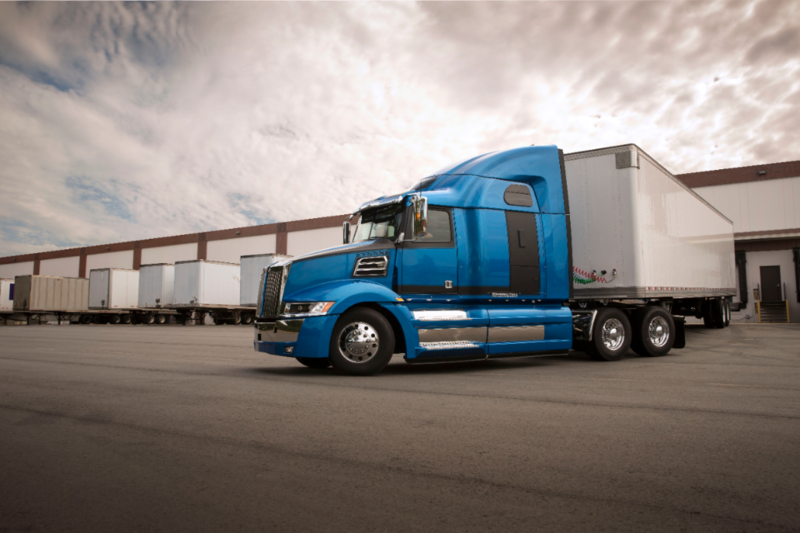 LAS VEGAS – Sept. 11, 2014 – Designed to optimize driver performance, the new Western Star 5700XE features many of the industry’s most advanced technologies to keep drivers safe and productive. The 5700XE features a fully adjustable steering column, and a state-of-the-art steering wheel with integrated controls for the stereo and cruise control, as well as a Bluetooth® connection for mobile phones. In addition, an all-new turn signal stalk includes integrated wiper and high beam controls. A new transmission control stalk on the right side of the column allows finger-tip control of the engine brake and Detroit™ DT12™ transmission, helping drivers stay focused and confident behind the wheel. Meritor WABCO OnLane™ Lane Departure Warning System: Audible, directional warning signals let the driver know if the truck’s course needs to be corrected. Meritor WABCO OnGuard™ Adaptive Cruise Control: Using on-board sensors and working with conventional cruise control, the 5700XE will automatically adjust vehicle speed to maintain the set cruise speed and a safe distance from vehicles in front of it. Meritor WABCO OnGuard™ Collision Mitigation System: This radar-based system provides visual and audible driver alerts through an in-cab dash display when the vehicle’s following distance could result in a rear-end collision. If the driver doesn’t take action, OnGuard’s Active Braking automatically de-throttles the engine and activates the service brakes. Intelligent Powertrain Management (IPM): A feature of the DT12 transmission, which is standard on the 5700XE, IPM uses GPS and pre-loaded terrain maps to evaluate the road profile up to three miles in advance and determine the most fuel efficient vehicle operation (including vehicle speed, transmission gear, and engine rpm). ABS brakes with electronic stability and roll stability control: Working together, the 5700XE’s ABS with electronic stability and roll stability control stabilize the truck, and can help reduce roll-overs, skidding and spinouts.